I love Greece. On Friday July 30th. 2010, our cruise ship pulled into the port of Argostoli. Greece's best-kept secret. We visited the Monastery of St. Andrew famous for housing a bizarre relic, which is claimed to be the sole of St. Andrew's right foot. During the 1953 earthquake the whitewashed covering of the inside of the church was loosened and revealed frescoes dating back to the 13th and 17th centuries which are now considered to be the island's biggest artistic treasures. We were not allowed to take photos, because it will damage the frescoes. Sorry. Next we visited the Rombola winery to gain insight into the production methods of the famous Rombola Wine made from a local species of grape, which comes in red, white and sweet Muscat. All wineries in this area are cooperative. Small grape vineyards contribute to the production of this wine. This is a great help to the over all economy of the region. 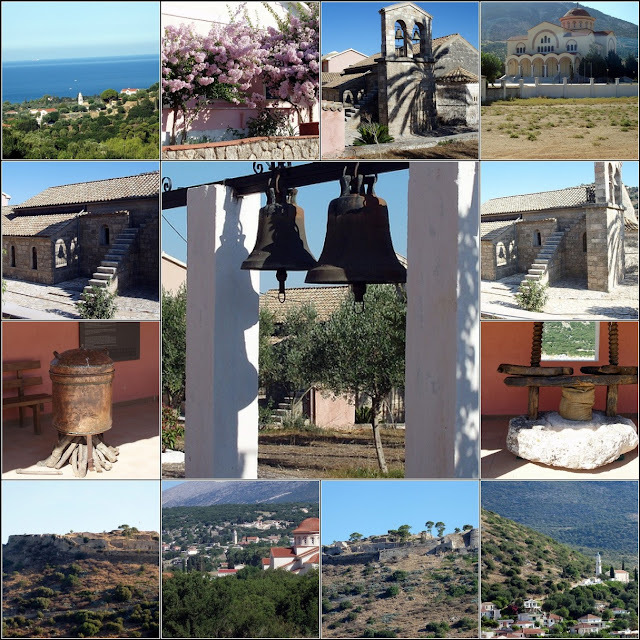 Next we visited the village of Kourkoumelata. The village was rebuilt after the earthquake of 1953 by a wealthy local citizen reconstructing the whole village in the neoclassical style. We wandered through the village and admired the sweeping views of the sea below. A photo stop was made at the Castle of St. George before we returned to the cruise ship. What a glorious morning we spent, visiting the sights for one of Greece's best-kept secrets. Hope you have enjoyed your visit to My Cozy Corner today. I would love to read your comments and become a follower too. Beautiful collage of the sights in Greece! I hope I will be able to visit some day! Hi Betty, I love Greece, too! It has a special place in my heart. It was there where I got married (in Santorini). I have not heard of Argostoli. It looks like one of Greece's many secrets indeed. The sights in your photo collage are breathtaking. I'm definitely going to Greece and I will keep this place in mind. It looked like you had a wonderful golden anniversary trip.